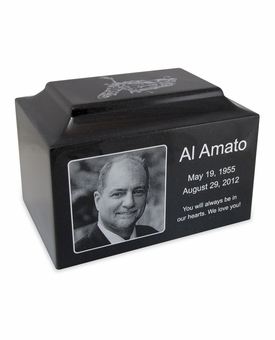 Our Black Granite Standard Size Cremation Urn Vault with Engraved Photo is an American made cultured granite cremation urn crafted in the heart of New England using state of the art composite technology and century old molding techniques. Photo are digitized then laser engraved on the urn in stunning detail. Cultured granite urns are luxurious in appearance yet very durable. 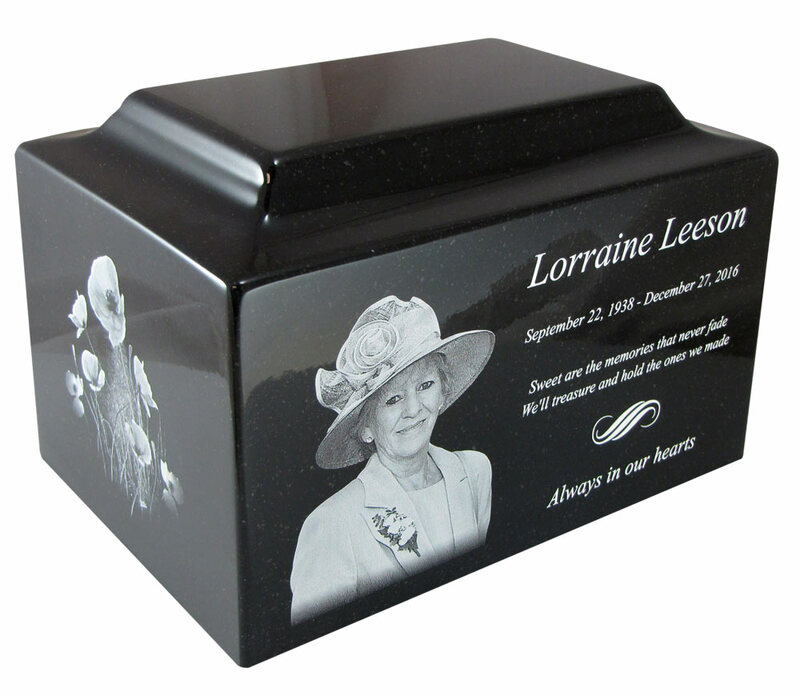 High strength and more resistant to denting and chipping than natural granite urns. Included in the price of this urn is (1) side which includes a photo and text (name, dates, sentiment). Additional photo sides are $35.00 and text/poems/custom graphics sides are typically $25.00. 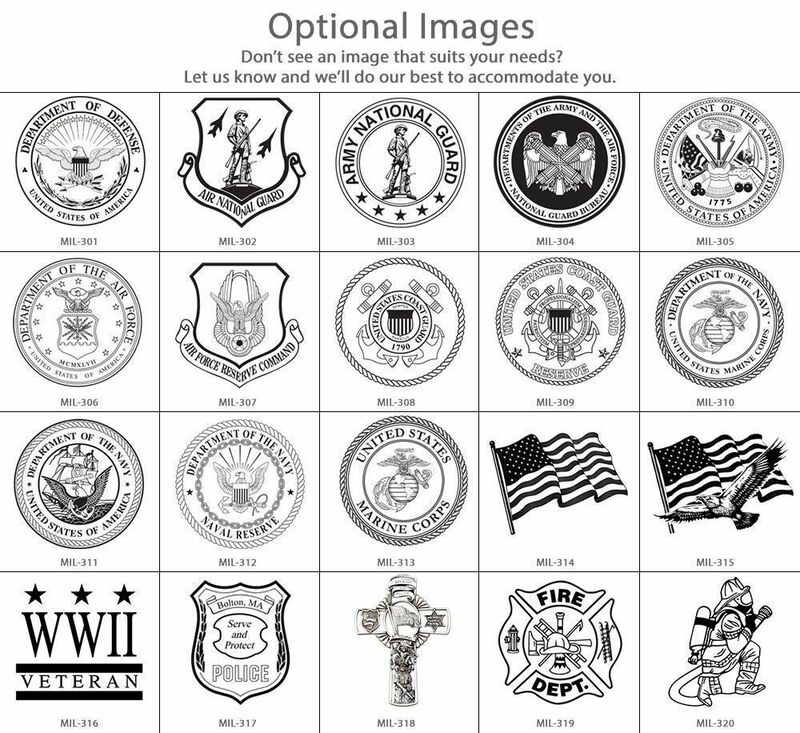 If your desired configuration is not available on this page, or if you need a customized layout please call 866-516.1296 and we can gladly assist you with designing your memorial over the phone. Material: Cultured granite is a precise blend of natural granite limestone and synthetic polyester resins. 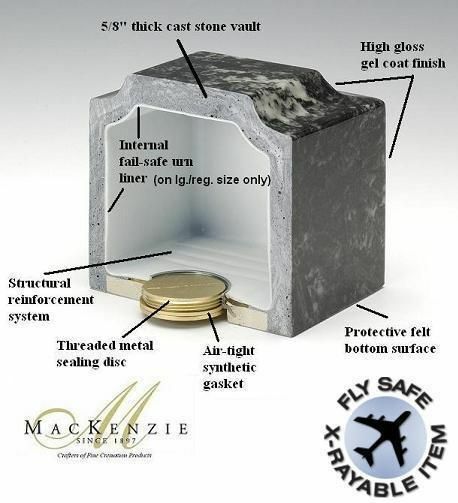 This urn is x-rayable and an approved for air travel. Click here for details. 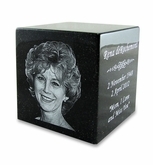 Our granite funeral urns can be used for display in the home, a columbarium niche or as a traditional burial urn. This urn is engineered to be as strong as a vault making it ideal for burial or permanent display. U.S Transportation Security Administration TSA tested and approved for air travel. Made of x-rayable material. A cotton velvet urn bag to protect the urn is optional. Due to the design, proofing process, and engraving, this item usually ships in 5-6 business days. 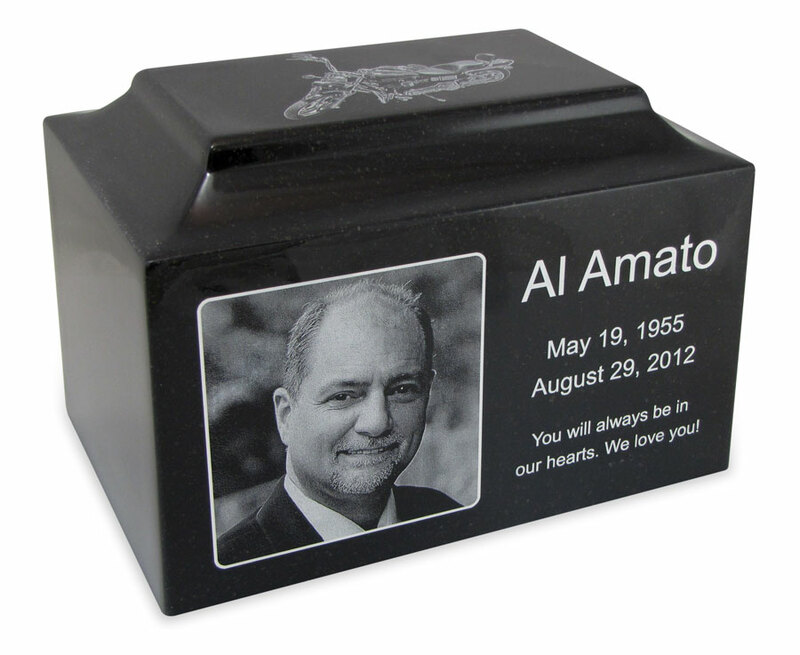 We will design your urn and email you a proof of what the side(s) will look like. The proof is typically emailed in less than 1-2 business days. 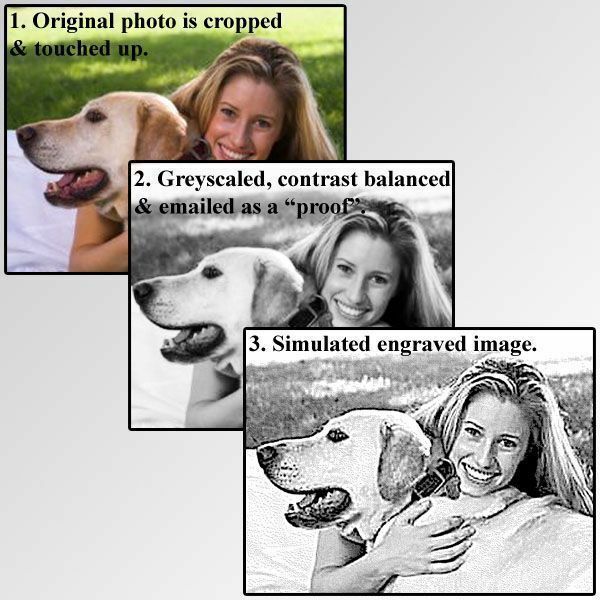 At this time you can make any corrections you may need or approve it for engraving. 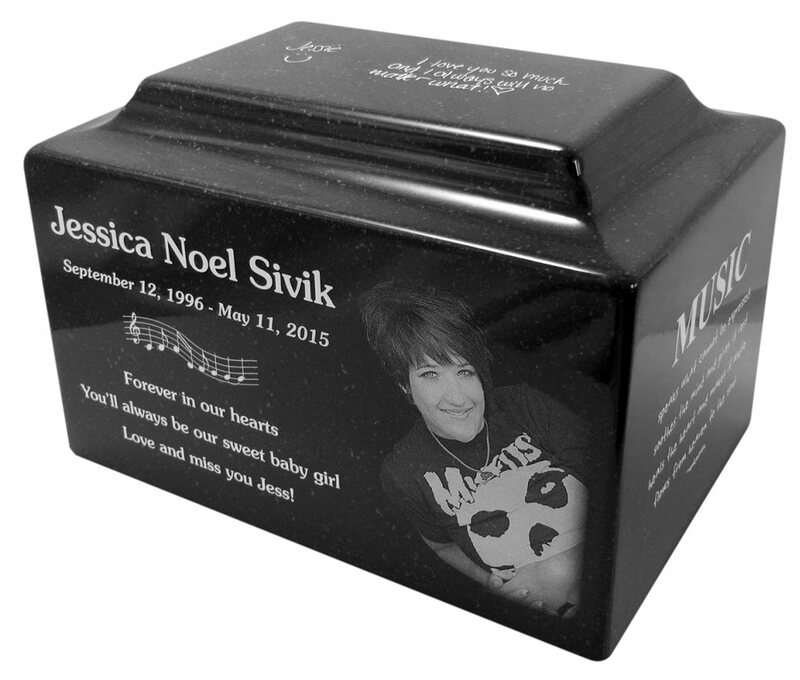 Once the proof is approved by you, the urn is engraved within 3-4 business days and shipped. Click here to view a sample proof. Photos: Click here for photo submission guidelines. 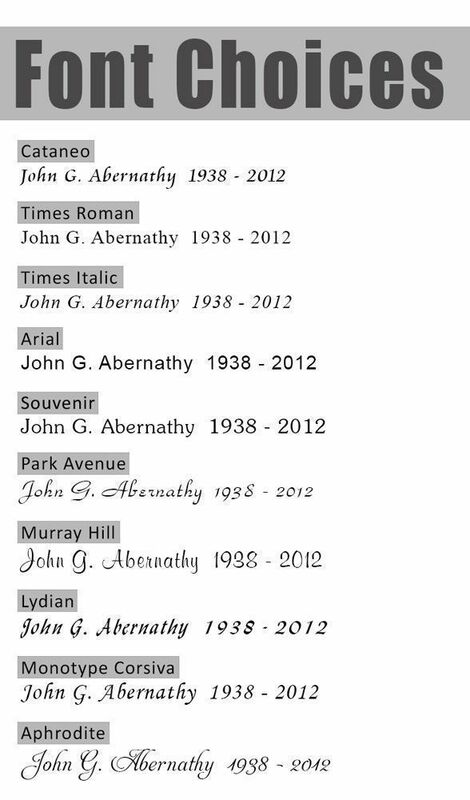 Click here for sample nameplate, engraving and epitaph layouts, inspirations and endearments. I live in the U.K and no one makes any nice Urns like i was looking for so searched online and found Mainely Urns and was just what i was looking for, the only downside was they did not deliver to my location so i had mine delivered to a U.S address and flew over to collect. 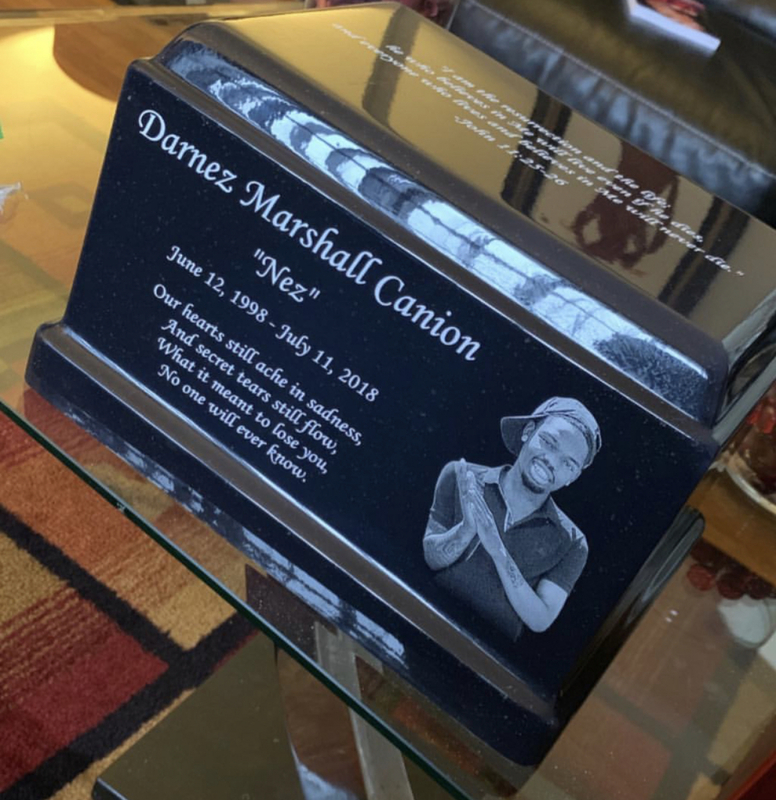 I can happily say i am more than happy with the Urn and the service i received and would not hesitate to recommend to anyone thinking of purchasing. My family and I absolutely love it! We got it for my son who was murdered. 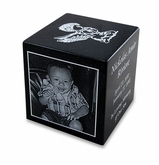 At first we had an urn that was far from who my son was, so we wanted to get him something that stood out just as he did. And Mainely Urns gave us just that. The detail and overall look exceeded our expectations! The urn was beautiful. So professional and sharp! My uncle would have loved it!!!! ProsPicture was great quality and the engraving was top notch! AMAZING product! This is absolutely beautiful. Everyone who sees it comments on it even the funeral directer, who sells urns, commented how beautiful this urn is. It cost a little more then some I looked at but I'm glad I made this choice. Cannot explain just how great this company is. Customer service was impeccable and the final product was incredible. This is a very high quality urn. We personalized it with a photo of my dad and a large beautiful eagle on top. Everyone who saw the urn was amazed at the quality. When we showed them the price, they were even more amazed. Easily cheaper than anything the Funeral Home was selling by at least $800. 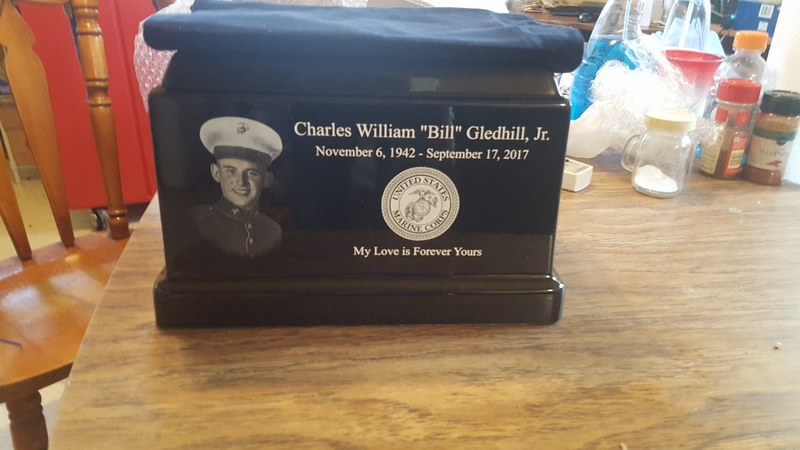 Had a special request to ship the urn to Texas in time for my Dads ceremony. Order was placed on a Monday for a Friday ceremony. The urn was overnighted and delivered with time to spare. Very well made and etching quality is perfect. I was blown away with the quality and beauty of the finished product. The team took the pictures I provided and cleaned them up way beyond my expectations. It brought all of us to tears when we saw it. The ordering process was real easy and communication was perfect. Thanks to the Mainely Urns team for helping us honor my father. Urn was beautifully done all of the family raved about it. I couldn't have asked for more. The funeral home we worked with for my Dad did not offer any type of urn that you could put a picture in it or on it. I got online & looked at various companies that had them and came across Mainelyurns. 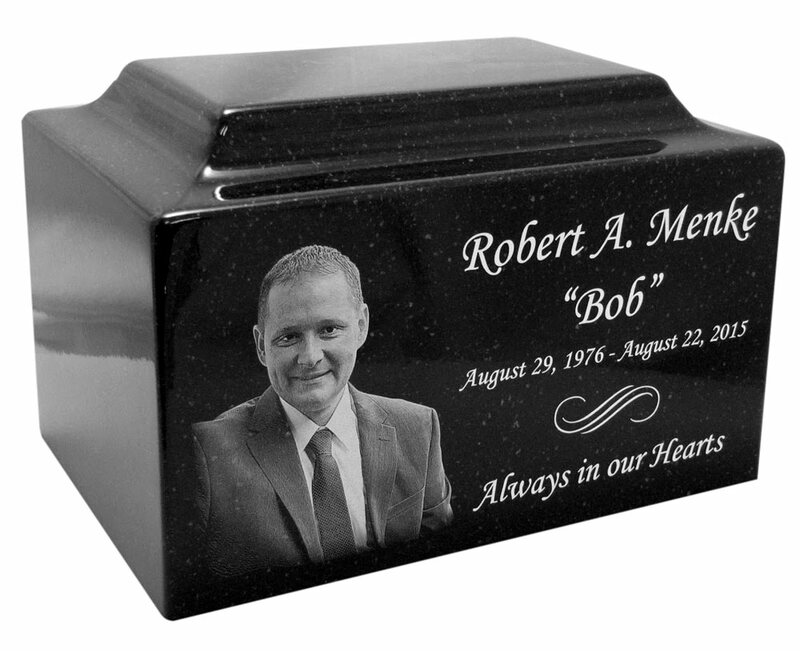 They have a lot of urns that you can add a picture to. Dad served in 2 different branches of the military and the urn had enough room to put both symbols side by side. Elegantly beautiful is the best description I can come up. Beyond Pleased works too. I could not have been any more pleased with this purchase! It is a true tribute to my dad. The workmanship is spectacular. It was a bit difficult getting images that would work, but the end result was well worth it! I would highly recommend this facility and the urn. Thank you for such a wonderful job and beautiful urn. This black marble urn was just what I was looking for. Everything went smoothly as I e-mailed pictures and got feedback on the quality of my photos and suggestions from the experts on how to make the urn not too cluttered but still show the personality of my beloved husband. The folks at Mainely Urns sent me the sample pictures and they were excellent. The turn around time was fast and I received the finished urn in just a few days. I opened the box and was blown away by this beautiful urn. I am so happy with the results and everyone who comes to my home just loves it. Thank you so much!! It was so nice. I loved it. It was so beautiful. I loved the photo and everything about it. We live in Nome, Alaska and ordered this product by phone. I was a little nervous about how the urn would look and was not able to look at a finished product up close due to where we live. Needless to say, I need not have worried; we were extremely happy with my husband's urn. It exceeded my expectations and was more than worth the cost. It is a beautiful piece of art. The proofs were sent to us within a day and the pictures that were laser etched were exactly like the photos we provided. In retrospect, I wish I had put photos on the sides as well. I would highly and happily recommend anyone to use Mainely urns. It's a work of art befitting the final resting place of my beloved husband. The urn is beautifully made. It is so elegant, I had tears in my eyes when I first saw it. It's a befitting place to put my beloved husband ashes in. The engraved photo made it so special . Amazing job. It took me a while to research other business that sells urns, Mainely Urns & Memorials are obviously the best in the business. The staff are so caring and are perfectionists, making sure they deliver the best, custom-made product for their customers. Shipping was fast. Highly recommend! ProsThe detail and everything is just beautiful! ConsI wish I paid attention to the sizing, it was smaller than I thought it would be. Highly recommend Mainely Urns for their service and product. The urn was great and the photos and engraving were very precise. ProsFriendly helpful personnel to help with our decisions. Prompt replies to questions and impressive with the speed and accuracy of getting proofs to us for final approval, then quick final product delivery. Highly recommend. This product was as described and engraving was of good quality. 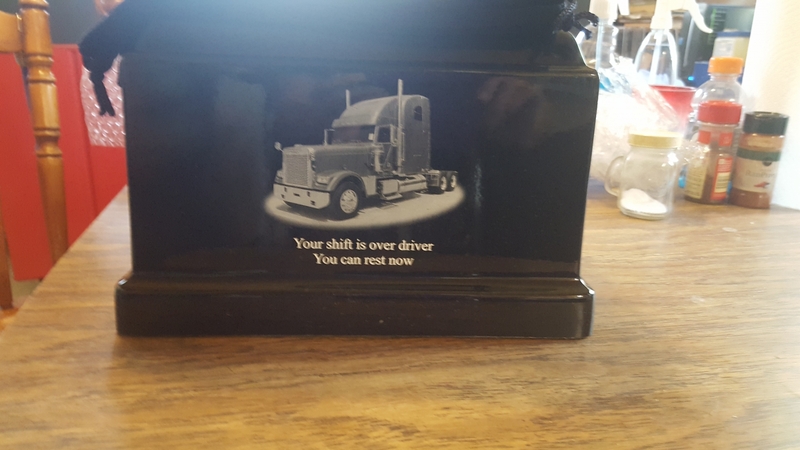 I received the urn very fast - 4 days after the order was confirmed. I made a typo mistake, and noticed it when I reviewed the proof. I made the correction right away. I got confirmation about the correction soon afterwards and the final was ready for me within a few hours. I am glad that I found Mainely Urns on my web search, and that I was able to get this dual marble urn. I am happy knowing that my father and mother will once again be side by side now, like they were for 42 years in life. My father had kept my moms remains for 18 years in a nice bottle, but now my Dad has joined my mom in this dual urn. I will be laying them to rest at a Veteran's cemetery with my dad's name on the front of the tombstone and my mother's name on the back. Finally a sense of peace for everyone. ProsNice slick finish and the engraving is awesome. ConsMarble dust inside the compartments, had to use an air hose to blow out the marble dust. Beautiful and Quality product, Prompt and Great Customer Service! This purchase was very easy and hassle free. I needed to add a portrait after I received it and they took it back with no hassle, added the picture and sent it back in a timely manner! I am thankful to them for the quality work, the great customer service and the turnaround time! 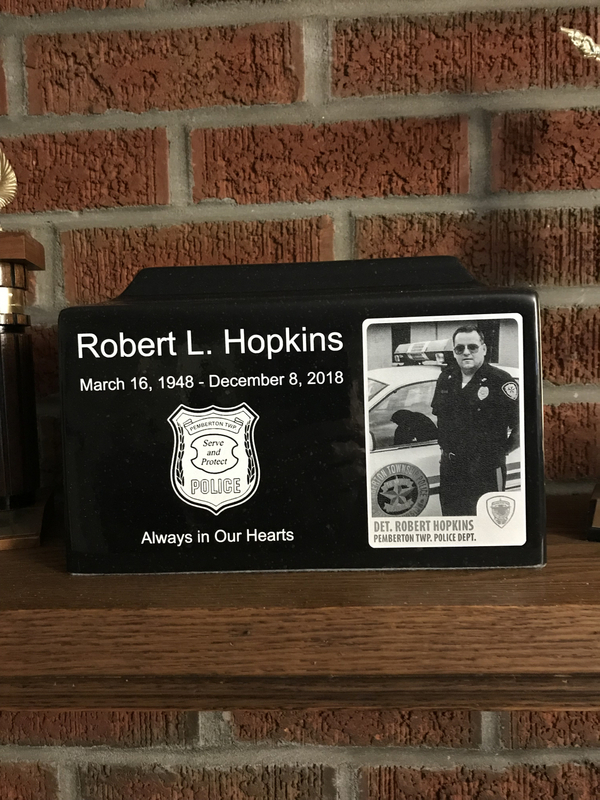 We just received our urn and it was absolutely stunning. The black granite was a nice material and the screening of the pictures and text was crisp and clear. Thank you for providing us with this urn. A beautiful piece for our beautiful baby boy. I sent in my father's 8x10 photo and the engraving was fantastic. We put the Air Force Emblem and a favorite quote of his on the front.. On the back side we had a little description of when he married my Mom, met my Mom, and when they had my brother and then me. He will be buried at Arlington. Although this will be in a tin liner, not to be seen anymore. Our hope is that 1000's of years from now when people are excavating old sites that if they came across this urn, they would know a little something about the man that used to be. As beautiful as my boy! My son's urn turned out beautifully! Mainely Urns made sure the proofs were exactly what I wanted, and were quick with making the change I requested. After I okayed the proofs, they made the beautiful urn that I proudly display. For something so sad to purchase, they did an amazing job! We were totally satisfied with the final product we received and could not have asked for better customer service in helping us to obtain the quality we were looking for. ProsFlexible customer service enabling us to get the best quality pictures on the product. The photos on the urn came out really beautiful. It is a beautiful resting place for our baby boy. Highly recommended. Very professional and compassionate staff. We have had an excellent experience with Mainelyurns.com. After several changes on my behalf they helped us through, and delivered our urn in beautiful condition. I want to recommend them to everyone. 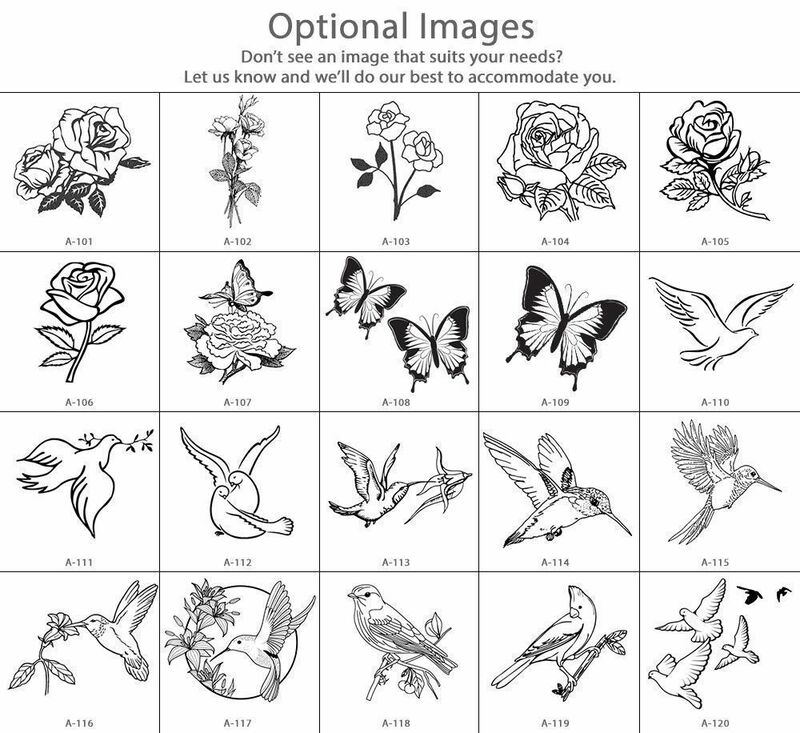 They do beautiful work and even help you with suggestions if you're not sure. Everything is sent to you to approve before anything is done. Your urn is packaged in 3 boxes with all kinds of packing. Fast, safe, and sound delivery. I have recommended to friends already. ProsCaring and talented people doing a very good job. We had a very good experience with all your personal. The product was just what we had decided on, and in perfect condition when we received it. ProsYou can change anything you want right up to the final drawings. My son's urn far exceeded my expectations!!! Exceptional quality, pictures and lettering came out beautifully. I have received the urn I ordered. It took me a while to compose myself to write this. The quality of work is astounding! This is not just an urn. It is a piece of art! THANK YOU! This brings honor to the memory of someone very special and loved. Your company should be very proud of what you do!